The fifth environmental action programme (5EAP) constituted the first comprehensive set of EU environmental objectives and targets. Amended EC Monitoring Mechanism for CO2 and other greenhouse gas emissions (CEC, 1999b). These instruments set national emission-reduction targets, but they are not broken down by sector. proposals to be brought forward by the Commission for further complementary measures to take effect from 2005. The follow-up programme (Auto-Oil II) is expected to result in new proposals at the beginning of 2000. Agreement with the car industry on the reduction of CO2 emissions from new cars. The European Air Quality Management project and Citizens. Networks aim to develop transport management measures to improve urban air-quality policy (e.g. improvement of public transport, diverting traffic from city centres, reduction of car use by means of parking policies, and promotion of cycling). Most Community legislation dealing with gaseous and noise emission standards for aircraft are based on the standards set by the International Civil Aviation Organisation (ICAO). Under the International Convention for the Prevention of Pollution from Ships (MARPOL), a new protocol to reduce pollution emissions (NOx, SO2) from ships was proposed in 1997, but this has not yet been adopted. Community Directives set maximum sound emission levels for vehicles, aircraft and machines. The Commission. s Green Paper on a future Common Noise Policy (CEC, 1996b) underlines the need for a more comprehensive EU strategy for noise. The UN Convention on Biological Diversity and the Pan-European Biological and Landscape Diversity Strategy set up a general framework for the conservation of habitats and species. Integration of biodiversity concerns into other policy areas is a key element of the Community Biodiversity Strategy (1998). Various international and national instruments for the designation of areas for nature protection are in place (e.g. the Birds Directive (CEC, 1979) and the Flora, Fauna and Habitats Directive(CEC, 1992)). Community spatial planning policies (notably, the European Spatial Development Perspective) aim at integrating environmental considerations into land-use planning. Some Member States have developed land-use policies and plans (restricting additional developments in certain areas). The Community Action Programme on Road Safety (CEC, 1997b) aims to reduce the annual number of fatalities from road accidents by at least 18 000 from current levels. The recent Commission Communication on air transport and the environment outlines a strategy to improve technical standards and related rules (for noise and gaseous emissions), and proposes the introduction of economic incentives (aviation charges, emission trading) and other market incentives (the Community. s Eco-Management and Auditing Scheme (EMAS), voluntary agreements with the industry). The aim is to achieve an improvement in the environmental performance of air transport operations that outweighs the impact of the growth in aviation (CEC, 1999d). Growing transport volumes and limited improvements in overall energy efficiency have resulted in a dramatic growth in energy use during the past decade. This has led to increased emissions of greenhouse gases (CO2), due to the overwhelming reliance on fossil fuels. This trend jeopardises the EU meeting its Kyoto Protocol targets of 6-8 % reductions in greenhouse gas emissions by 2008-2012. 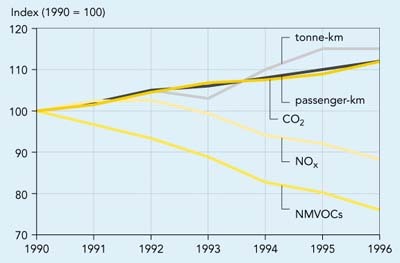 Emissions of NMVOCs and NOx have declined as a result of technological improvements, but this has been partly offset by growing transport volumes. Although there have been improvements for certain pollutants, urban air quality remains poor in most European cities. Road and rail infrastructure takes land mainly from agricultural use, but also from built-up areas, forests, semi-natural areas and wetlands. Linear infrastructure can constitute an important barrier, dividing communities. Transport infrastructure also imposes a significant threat to nature conservation by fragmenting and disturbing habitats and putting areas designated for nature protection under pressure. Already 65 % of Special Protected Bird and Ramsar areas (wetlands) are near major transport infrastructure. Noise annoyance from transport is increasing with traffic growth, especially near roads, railways and airports. It has been reported to affect human health and wildlife. Transport accident fatalities have decreased markedly during the 1990s, in spite of rising traffic volumes, but road accidents still claimed some 44 000 lives in the EU in 1996. Environmental threats from transport continue to be closely linked to transport volumes. This emphasises the need for corrective policy measures, which aim both at improving eco-efficiency by technical means and at reducing the growth in transport demand through improved transport pricing, public education and better integration of land-use and transport planning. For references, please go to https://www.eea.europa.eu/publications/ENVISSUENo12/page005.html or scan the QR code.